Grandma Susan (as her grandchildren fondly refer to her) is the kind of Grandma I aspire to be. In fact… she’s the kind of human being I aspire to be. I met Susan through her oldest grandson, who was my youngest son’s “roomer” in college. To know Susan is to love Susan. Her joy for life, her positive attitude, her love for her family, her smile, the undeniable glow that radiates from her and touches everyone she encounters…. There is something very special about Susan, and I am so fortunate to call her my friend. Can you believe how sweet this is? You see, Susan is a retired school librarian and long-time lover of books and reading to children (and especially her grandchildren!). 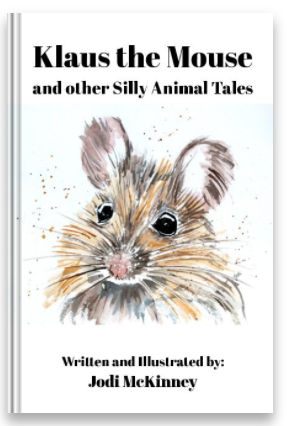 I guess it really is true that Klaus the Mouse and other Silly Animal Tales is a book for children of all ages, and it’s been so fun hearing stories from folks who have purchased the book. Susan’s granddaughter, Charrie, told me Adele the Gazelle was her favorite character. Thank you, Susan, for sharing your love, and for all your beautiful grands who gave permission for us to share. 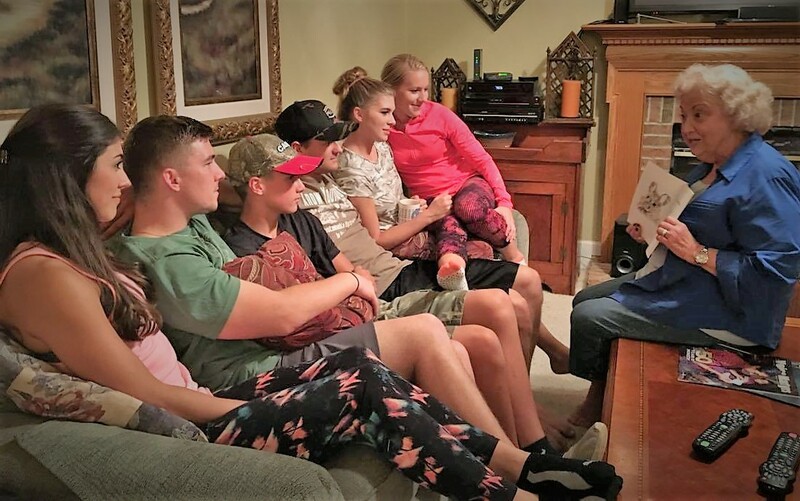 I’m a new grandma, whose first granddaughter is not even a year old, but I hope I will be as loved and adored as Grandma Susan when my grand(s) are teenagers and married! What sweet story Jodi, I love the picture! Thank you Sharon! Isn’t it so sweet??! How very sweet! I want to be like Grandma Susan too! Susan is such a sweet lady! You would love her Mary! 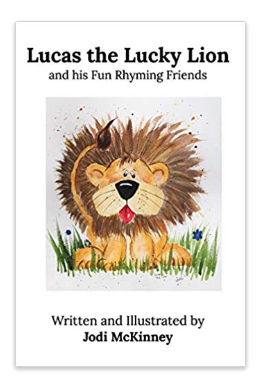 Klaus the Mouse and his friends are bringing joy everywhere they land! Grandma Susan is the person we all must strive to become. Reading to our children and grandchildren is a gift that one gives and receives. Cheers to you Jodi, for this gift that you have given and may you receive much in return. Thank-you for sharing this delightful story and photo. Awww, how sweet! Susan sounds like a truly wonderful person and her grandchildren are all beautiful and handsome! She sure is a wonderful mentor! So sweet! Right??!! She is such a special lady and grandma! This is so sweet Jodi! A lovely story Jodi – no pun intended…. ! This truly is lovely and heartwarming!!! Susan is an extraordinary woman. I admire her so!!! so excited for you Christine! enjoooooy!!! Hi Jodi, I didn’t know you have published a book! Congrats! It’s so good to see the respect and love in this photo. This is absolutely adorable! Thank you for sharing about Susan. God bless her heart. Susan is one in a million. Thank you sooo much Gary!! Grandma susan is well loved! Tell your daughter the tongue twisters might get better with wine!! 🙂 – Oh Ann – the wait is so exciting – the birth is such a miracle – and every day that passes is more and more wonderful when you become a grandma! cannot wait for you!!! Susan is soooo special. You can tell by the adoration of her grown grands. Isn’t it precious??! !